I think the University of Washington is a legitimate National Championship contender for the first time in a long while, but we should find out for sure if that's true Saturday when the No. 4 Huskies visit No. 17 Utah in a potential Pac-12 Championship Game preview. ESPN GameDay is in Salt Lake City for the showdown. I think oddsmakers are a bit skeptical of the Pac-12. For good reason, I think. Usual powerhouses Oregon and Stanford have completely crashed. UCLA was the preseason favorite in the Pac-12 South but has played so badly that Coach Jim Mora could be in some trouble despite a massive buyout and recent contract extension. So the conference's only hope of not missing the College Football Playoff for a second straight season rides on Chris Petersen's Huskies. They are +900at Bovada to win it all. Take a look at UW's schedule. Knowing what you know now about the Ducks and Cardinal, that schedule looks very unimpressive. There are no ranked teams left on it after this game, as Washington will be favored to win at Cal, home vs. USC (Trojans are surging) and Arizona State, and at Washington State in the Apple Cup. Should Utah win, the Pac-12 is going to be out of luck in terms of the playoff. That would also hugely help one-loss teams elsewhere like Louisville and Ohio State. 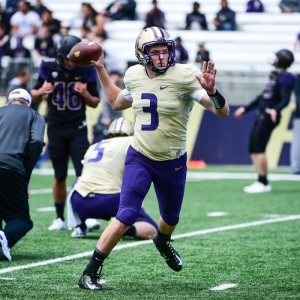 I'm looking forward to seeing Washington's Jake Browning, the lock Pac-12 Offensive Player of the Year and +1000 to win the Heisman, go up against a Utah defense that leads the conference in interceptions and has held opposing quarterbacks to a 53.5 percent completion rate. Browning ranks No. 2 the FBS in pass efficiency (199.6), No. 3 in touchdowns (26) and in yards per attempt (9.94). Washington could still lose this game and win the Pac-12 North as long as it doesn't lose again. Utah is tied atop the South with Colorado, and those two still have to play. The Huskies are 10-point favorites and while I think they win, I'd take the points -- a few sportsbooks have it still at 10.5, and I'd go there. Utah earned its first victory ever against Washington last season in Seattle as a 24-point outburst in the second quarter led to a 34-23 victory. Here are some news, notes and any major line moves for some of Saturday's games around the country, in no particular order. Northwestern at No. 6 Ohio State (-27, 53.5): Have to say this line surprises me as it has risen a whopping six points. Look, I get that Ohio State is one of those teams that the casual public loves to bet, much like a Notre Dame or Alabama. And I get that Urban Meyer teams almost never lose consecutive games. But 27 points!? Northwestern is not the same team that opened the season with home losses to Western Michigan (doesn't look so bad now) and Illinois State. The Wildcats have won three straight games and have the Big Ten's leading rusher in Justin Jackson and top receiver in Austin Carr. Jackson has rushed for 453 yards and three touchdowns in the last three games, while Carr has 24 catches for 328 yards and six touchdowns in that span. The defense has shut down the running game in the winning streak as opponents are averaging only 2.4 yards per carry. I'm not saying NU will win this game, but I'll be surprised if the Cats don't cover. No. 7 Nebraska at No. 11 Wisconsin (-9, 43): The line has risen 1.5 points. I believe the winner of this game will play Ohio State in the Big Ten Championship Game. The Huskers are the only West Division team without a loss in conference and have a one-game lead over Northwestern and two over Wisconsin. Assuming NU doesn't beat Ohio State on Saturday, you can all but put the Huskers in the conference championship game with a win here. Wisconsin, meanwhile, would have major life with a victory as Nebraska probably loses next week at Ohio State. The Cornhuskers are expecting back wide receiver Jordan Westerkamp, who has missed the last two games with a back injury. He has 13 catches for 228 yards and four scores. Wisconsin, meanwhile, has lost linebacker and leading tackler Jack Cichy to a season-ending torn pectoral. He has 60 tackles and ranks second on the team in tackles for loss (seven). He recorded 15 tackles against Ohio State two weeks ago and was named the Big Ten's Defensive Player of the Week. Big loss for a UW defense ranked fourth in the country in scoring defense (14.3 points per game) and ninth in total defense (300.6 yards). No. 15 Auburn at Ole Miss (+4, 63): This opened with the Tigers at -2.5 Auburn is expecting starting running back Kerryon Johnson to return from injury for this SEC West matchup. He injured his ankle two games ago on the opening series against Mississippi State and then missed last week's game vs. Arkansas. Didn't matter as Auburn rushed for 543 yards in the blowout of the Razorbacks, the most ever by one team in a regular-season SEC game. Johnson has 538 yards and six touchdowns on the year. If anyone has a harder schedule than Ole Miss this season, I'd like to know who. This is the sixth ranked team the Rebels have faced and they have just one win against them, over currently unranked Georgia. Ole Miss can't stop the run, ranking 113th nationally and having allowed LSU's Leonard Fournette to rush for a school-record 284 yards last week. That obviously could be a problem this week. Miami at Notre Dame (+2, 58.5): The Irish opened as 1-point favorites for what used to be arguably the most heated rivalry in college football. It's the first on-campus meeting between the two in 26 years, and the game has the smallest spread on the board. The Hurricanes were once ranked 10th in the country but have fallen apart since a close loss to Florida State on Oct. 8 -- that has been a trend the past few years. UM gets so geared up for the Seminoles, loses a game it could have won and then has nothing left in the tank. To be fair, Miami has been absolutely gutted by injuries, especially on defense. But a very successful 10-win season (with a bowl victory) is still doable for Coach Mark Richt with a win here as the rest of the regular-season schedule is fairly easy. The Irish, of course, were an early-season Top 10 team but have face-planted. They basically have to win this to have a shot at a bowl game. Both starting quarterbacks in this game, Notre Dame's DeShone Kizer and Miami's Brad Kaaya, are expected to be first-round picks in next year's draft if they declare. Kizer could go No. 1 overall. Got free picks? Doc's does. And for new clients we would like to offer you $60 in free member's college football picks from Doc's Sports Advisory Board of college football handicapping experts. Click here to sign up today. We never require a credit card for this offer, and you will never have to deal with a salesman.